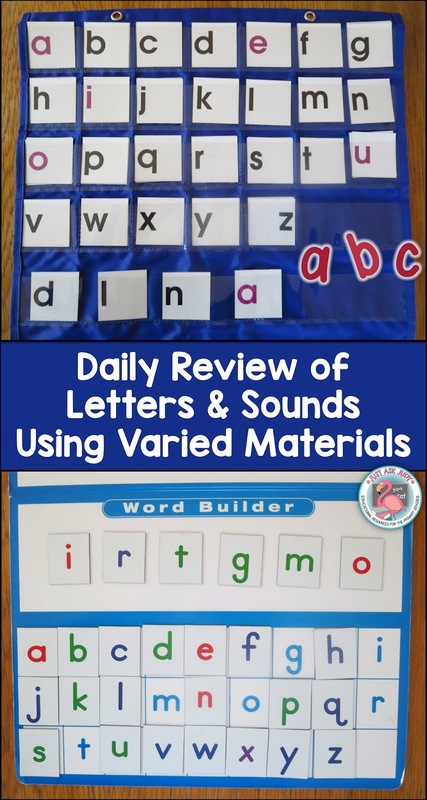 In a previous post, I wrote about ideas for introducing letters and sounds using Orton-Gillingham or multi-sensory methods with children who benefit from explicit instruction. These ideas can be extended to the daily review of letters and sounds. For reading, the letter/ picture sound card is presented visually. Students respond individually or chorally by naming the letter and picture, then producing its sound. At least some of the time, the letter should be formed while naming it. For spelling, the sound is presented auditorially (without any visual cues). Students respond by naming the letter and picture, then producing its sound. Again, at least some of the time, the letter needs to formed while naming it. When teaching, I almost always had time to review an entire deck with an oral response. When including letter formation, you may want to select 7 to 10 letters for review. If your time is limited, you can review for reading and spelling on alternate days. You will want to gradually fade out the use of letter/ picture sound cards to letter only cards. Students respond in the same way, including naming the picture which is not seen. 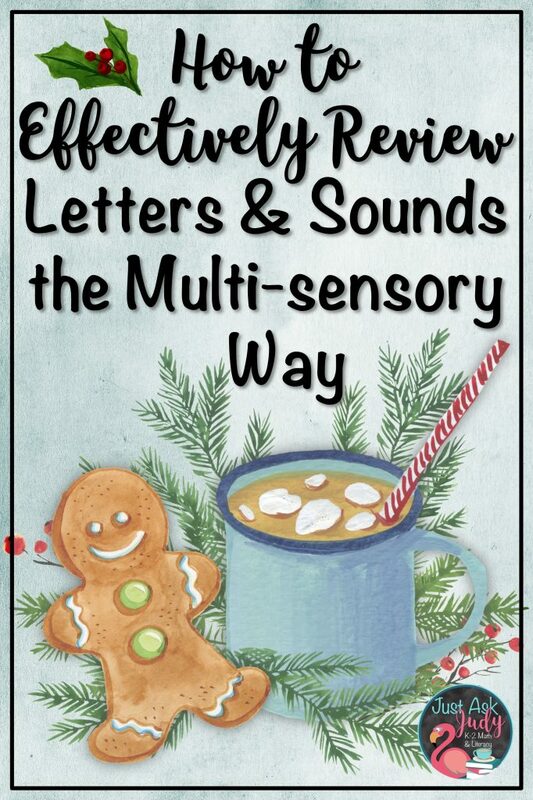 Continuing to review letters and sounds employing the visual, auditory, kinesthetic, and tactile senses gives your students the opportunity to follow their strongest paths for learning. I can recall one student who would use his finger to write a letter on his desk to recall its name or sound and another who still needed to name the letter and picture to recall the sound in second grade. Skywrite using the techniques in this post. Write on the chalkboard with or without handwriting lines. Write on individual whiteboards with or without handwriting lines. Use Magic boards. I found mine at Lakeshore. Write using appropriately lined paper or landscaped plain paper with a folded baseline. I love the Smart Start paper and Super Slate whiteboards. Make and use gel bags. Thia at Capitals First wrote a wonderful post about durable gel bags. Provide sensory trays and use fingertips for writing. Employing a variety of materials will help keep your students motivated! Some of these ways work best with individuals or small groups but others may be used with a whole class. I have also used magnetic letter boards and pocket chart letter/ sound mats for spelling responses. These lead right into spelling words. Students respond by moving the letter to a designated spot while naming the letter, its corresponding picture, and sound. I love the idea of using sensory writing trays with individuals or small groups of students. 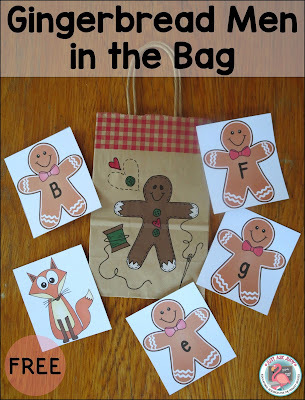 I was inspired by the imagination tree‘s Gingerbread Sensory Writing Tray to create a set of printable gingerbread man letter (upper and lowercase) and number cards (0-20), in color and black/ white. When using them for practicing number or letter formation, be sure to have students name the number or letter/ picture/ sound while forming. I found the salt with spices to be a bit dusty, so I opted for the rice idea from Frogs Snails and Puppy Dog Tails, instead. I replaced the white rice with brown, omitted the food coloring, added a small amount of water, spread a thin layer on a parchment paper lined cookie sheet, and baked at 200 degrees for about 20 minutes. I used equal amounts of cinnamon, ginger, and nutmeg. Afterwards, I discovered you can actually buy gingerbread spice! The gingerbread man baking pan (found on sale at a grocery store) is cute as can be and perfect for one child. These holiday paper plates, practical for a small group, are both deep enough and sturdy enough to hold the rice. They could be carefully stacked for reuse. It was also easy to pour the rice into a baggie for storage. Using a variety of seasonal number cards for counting, identification, and sequencing activities helped provide motivation for my students to complete repetitive tasks. So why not use seasonal letter cards too! The gingerbread man letter and number cards can be used as seasonal review cards (or in any way you can imagine). I added a page of fox cards to add a little excitement to your games! One easy to prepare review game is to simply put your set of cards in a decorative seasonal bag. Just drawing from the bag increases engagement! Students take turns to draw a card and respond. If the response is correct, the student keeps the card. You can add a few fox cards and decide what happens when one is picked- lose a turn, put 1 or more or even all your cards back in the bag. 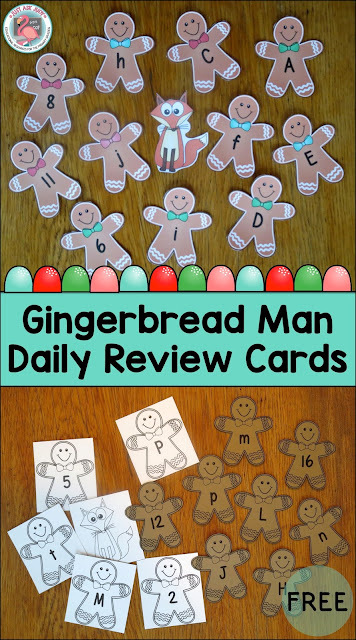 I’d love to hear how you use the gingerbread men review cards! Additional Christmas themed resources are available in my Teachers Pay Teachers store. 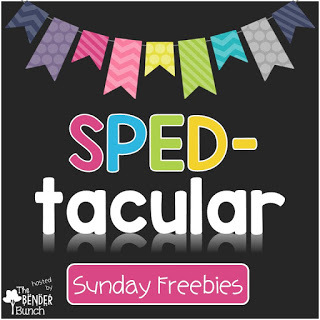 Be sure to stop by The Bender Bunch to check out the SPED-tacular Sunday Freebies. There is a variety of gingerbread themed activities scattered throughout my ‘Tis the Season Pinterest board.